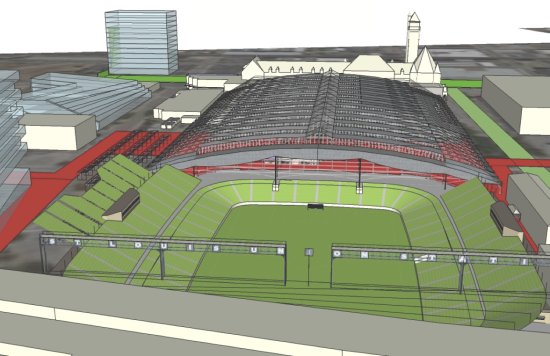 St. Louis–based SPACE Architecture + Design has release a series of renderings for a speculative Major League Soccer (MLS) stadium for downtown St. Louis. 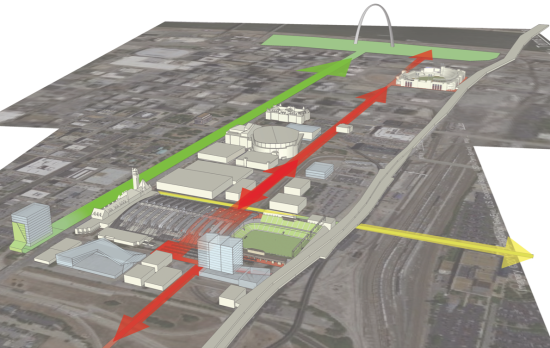 This proposal comes in the wake of news that the NFL’s St. Louis Rams football team would be leaving St. Louis for Los Angeles, and subsequently not building a new stadium along the Mississippi River. Sports buzz has picked up again about a possible MLS team making its home in the city. Since the news that the city would be losing the professional football team, MLS Commissioner Don Garber and State Governor Jay Nixon have continued to discuss the possibility of an expansion team in St. Louis. 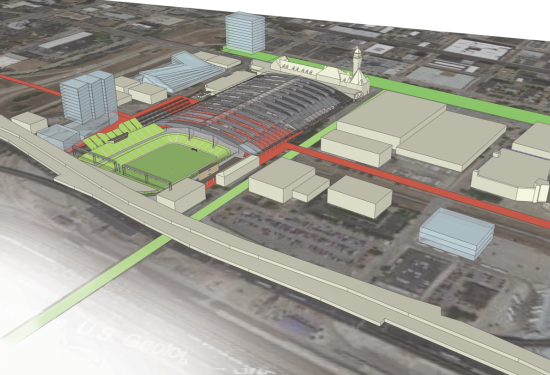 The offices proposal involves a sunken field directly south of the historic Union Station. Union Station itself is under redevelopment. Located along Clark Street, SPACE envisions its proposal as a part possible downtown sports corridor, which would include the Major League Baseball Busch Stadium, home of the St. Louis Cardinals and the Scottrade Center, home of the National Hockey League’s St. Louis Blues. And though the proposal is an unsolicited speculation, the discussion of funding a stadium is already being taken seriously by state legislators. A ballot initiative has been presented by State Rep. Keith English to incur a one tenth of one percent sales tax in St. Louis and St. Louis County. The bill is written as to try and avoid a similar fiasco as the current Rams stadium, Edward Jones Dome, which has not been fully paid for despite the team leaving the city.